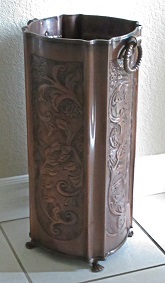 Antique-inspired solid brass umbrella stand in Gothic arch design with garden floral motif. Antique brass finish with a darkened bronze effect. Reminiscent of perennial English gardens, embossed flowers and vines surround the entire piece. Solid cast brass "rope" ring handles compliment the top and bottom quarters which feature gentle overlapping petals. The hand-detailed finish is gently antiqued and lacquered to resist tarnishing. Sturdy construction makes this umbrella stand suitable for residential or commercial applications. Height 18.5" (overall), Diameter 8.25" (measured across top). Note: Finish patina and dimensions can vary as each piece is hand made. Solid Brass Umbrella Stand with weighted base. Lacquered to resist tarnishing. Height 26" overall. Diameter 10" measured across top opening. Diameter of base 7.75" Note: Finish patina, dimensions or weight can vary slightly as this is a hand made item.